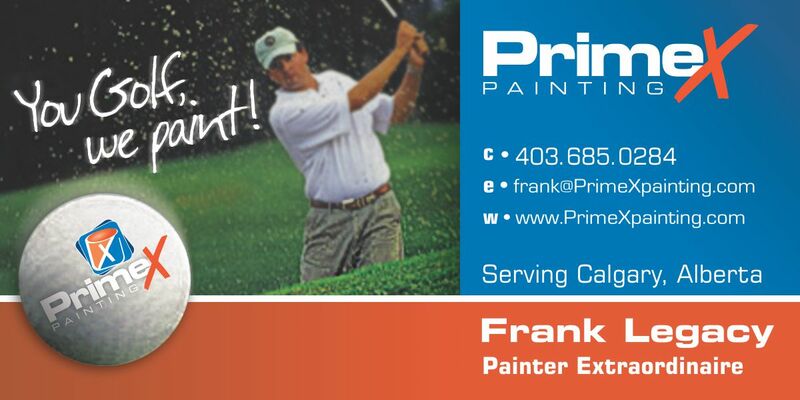 PrimeXPainting You golf, We paint! There’s no doubt about it—you appreciate quality, professionalism, efficiency and workmanship. We know, because you’ve been telling us. You’ve also reported that even though you were doubtful at first, contracting the project turned out to be a painless procedure. Our clever staff was quick, courteous, trustworthy and efficient. You were pleased to find their work didn’t interfere with your day-to-day lives, so you looked forward to the job rather than dreading it. You were relieved to find your home and belongings were safe and secure. At PrimeX, we’re excited about such feedback, because it means we’ve reached our goal to develop an efficient work process. Our excellent staff provides clients with a safe and pleasant experience. So, our hard work has paid off with great results! With this idea of trust in mind, we’re happy to announce the launch of a new advertising campaign. You might see it if you’re on the golf course this summer. Our new slogan, “You Golf, We Paint!” encourages you to trust us with that overwhelming-but-necessary paint project, so you can focus on other important things, whether it’s golf or something else. No matter what fills your day, you can concentrate on your tasks fully, knowing PrimeX Painting is making your commercial or residential project perfect.